Acting President President Yemi Osinbajo on Friday said that African countries must solve their problems themselves. Addressing journalists in Kigali, Rwandan Capital, after attending the inauguration of President Paul Kagame, Osinbajo maintained that African nations could take leadership in all respects. The acting president stated that Nigeria was demonstrating this, especially in containing the insurgency and tackling the humanitarian crisis in the northeast. 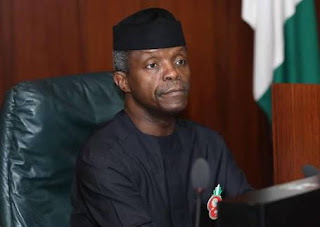 Osinbajo said: "That is a theme that has gone through the African Union and it is very resonant that we must solve our own problems; that Africa can solve its own problems and I think African nations have begun to demonstrate that. "We have shown in Nigeria that whatever problems we have, we can resolve them. We are doing so in the north-east, we are doing so with the humanitarian condition and all of that. "We are saying that we can take leadership in various respects, leadership in our economy, handle the commanding heights in our economy, be directly involved in the destiny and future of our countries. And I think the point that he (Kagame) made is an important one and it's one that is being demonstrated all over Africa." Osinbajo affirmed that Kagame had shown excellent example of leadership, particularly in the East African region, saying that was why he was re-elected. Earlier in his inauguration speech, Kagame said Africa must look inwards as its governance and prosperity could not be outsourced. Kagame, who took the oath of office for another seven-year tenure, specifically urged African leaders to deliver the results expected by their citizens. "There is no justification for all the efforts that will cut Africa off from itself. There is no single model of nation building. Good choices are built on the mindset summarised as 'do it yourself'. Every African country has to continue to live with its efforts, not of someone else's task. There is exceptional leadership and ingenuity in us, only that we've been accustomed to seeing the other way," he said. He thanked Rwandans for renewing the trust in him, saying "It's a privilege to serve them. We've lived a life unprecedented and shocking, but we've made progress with our resilience. We've worked hard to rebuild our nation in a spirit of consensus where nobody has been left behind." He also thanked other African nations for being with Rwanda during its travails, assuring that his country would continue to partner with them. Kagame, 59, first assumed office in 2000 when his predecessor, Pasteur Bizimungu, resigned. Kagame had hitherto commanded the rebel force that ended the Rwandan genocide in 1994.